Gratitude in surviving. Greed in living. Concerning past life readings, tarot readings, etc. I’ve opened an art shop! Click here for "How Readings Work"
Existing Clients: please select your reading option from our menu here. I haven’t done a dressgasm in a while, so I thought it was high time I got back into it. I found this dress on eBay, where I find most of my dressgasm examples. 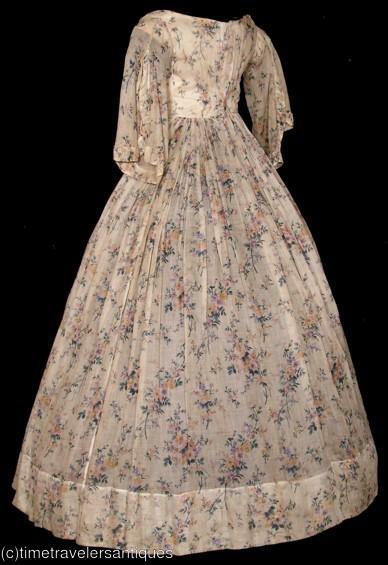 Today I bring you a dress from the 1850s, as in pre-Civil War. In the nineteenth century, it was common for young women to wear gauzy see-through fabrics in the summer when the weather was too hot for heavy wool or other fabrics they used in the winter. Of course the bodice sufficiently covered the lady so she was as modest as expected, but the thinness of the fabric allowed for a breeze to keep her cool. This fabric is beautiful and luxurious because of the size and irregularity of the print. As a rule of thumb, the larger and more complicated the print, the more the lady had to buy so everything would match in the pattern. That means the lady had some money to spend on her wardrobe. 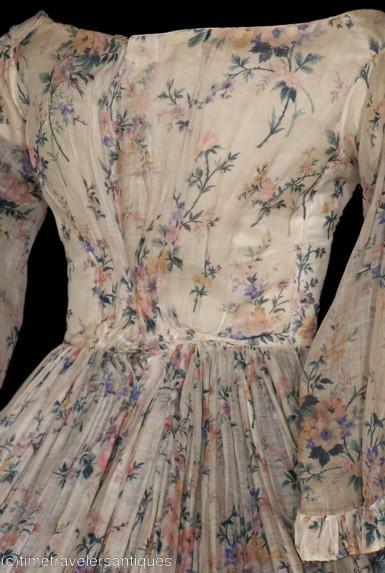 I have not seen a flower print like this before so it is quite unique in my experience of studying nineteenth century clothing. The lady who owned this dress was most likely in her late teens or early twenties. Once a woman was established in her marriage and having children, she probably wouldn’t wear dresses like these anymore. It would have been like Mariah Carey being in her 40s and still dressing like she’s 20. This lady would have worn undersleeves under the pagoda sleeves of the dress and the skirt would have had her petticoat visible underneath as well. She would probably have worn a necklace and a light bonnet with flowers to match the dress as best as she could, but since she probably had money, she may have had a bonnet or hat specifically made to match such a lovely dress. >ummm… Mariah DOES dress like she did in her 20's!! LOL But the dress- c'est magnifique! >I had a dress that was similuar to this back then. John loved it as I recall! >oh wow. this is true vintage! I wonder how much it would fetch on ebay.